Travel in style and comfort while you visit some of Costa Rica’s most exclusive destinations! Our selection of the best 5 Star Hotel in Costa Rica won’t disappoint! We have researched the highest quality, most recommended luxury accommodations. Luxury Hotels in Costa Rica ensure the most special vacation, with the highest quality facilities and services that guarantee excellence. Luxury travel is more than just sightseeing; it’s about the whole trip! These hotels and resorts specialize in making your stay the most comfortable as possible, with personal attention and attention to detail that makes your time here so memorable! Whether you are looking for breathtaking views, tranquility, elegance, pristine natural settings or supreme comfort, Costa Rica’s luxury hotels are unrivaled. Spoil yourself in 5-star rainforest retreats, beachfront resorts and volcano view hotels for an unforgettable and unique vacation. These luxury hotels boast 5-star quality, only the best! Take advantage of the luxury services and amenities these resorts and hotels offer! From a specialty spa retreat to gourmet restaurants, these hotels will cater to your every desire! You will leave Costa Rica with memories of an enjoyable and relaxing vacation. If you are a nature lover, you will be relieved to hear that many of these luxury resorts and hotels are also eco-friendly! In fact, these eco-luxury hotels are part of a community of award-winning Costa Rican 5 star hotels dedicated to conservation and the local community, called the Cayuga Collection of Sustainable Luxury Hotels. Whether you prefer an eco-luxury resort or a 5-star all-inclusive hotel, there are options for everyone! Costa Rica is Central America’s volcanic, tree-covered jewel. The tropical rainforest that covers most of the country is teeming with unique wildlife and the beaches here are just as famous for their sea turtles as their surfer-drawing swells. There is a phrase you’ll see and hear all over Costa Rica: “pura vida”. It means “pure life” and it’s a fitting unofficial motto. Imagine this: Eating breakfast while sloths lazily crawl between trees nearby, spending your day either in the tropical rainforest, exploring waterfalls or at one of the untouched beaches and then ending your day with your feet up and a cocktail in your hand. This is exactly what “pura vida” means and what you can expect from your Costa Rica vacation. The only way that you can top this daydream is if you choose to stay at one of Costa Rica’s world-class hotels and resorts. Ranging from small, intimate boutiques and treehouse rainforest lodges to over-the-top beach resorts, Costa Rica offers all kinds of 5 Star hotels. So, if you’re planning a getaway to the lush country of Costa Rica, but want to spend a little extra for top accommodation, you’ve come to the right place. Get inspired by our Top picks of 5 Star hotels and resorts in Costa Rica! Luxurious in every way, the 16-room, adult-only resort Nayara Springs is the top resort in the Arenal area for guests seeking comfort and privacy. The resort was specifically designed to make you feel relaxed, secluded and in harmony with nature. Enjoy the outstanding service offered at Nayara Springs, for example the luxurious spa with private open-air treatment pavilions, saunas and a variety of organic facial treatments. If you want to escape the tropical humid air you can always jump into one of the two spacious infinity edge pools that blend into the forest, where you can spy toucans, hummingbirds or macaws. Even though the Nayara Springs Hotel is an oasis in the middle of the rainforest, you should take advantage of one of the exclusive & private experiences off-site. Discover one of Costa Rica’s gems, the Rio Celeste or experience the rainforest like never before on the Mystic Hanging Bridges. ­­­­­­ Pacuare Lodge is a luxury, eco-hotel situated on the banks of one of the world’s most scenic, white-water wonders, the Pacuare River of Costa Rica. The 5-star hotel offers you every activity that you might be seeking. Whether you prefer the adrenaline rush of an adventure tour, the diversity of tropical flora and fauna, or simply want to enjoy the calmness of the rainforest, Pacuare Lodge offers experiences to make your Costa Rica vacation dreams come true. Recover from an action filled day at the spa and treat your mind, body and soul to a variety of treatments. Pacuare Lodge is perfect for anybody who is in search of an authentic, simple and yet sophisticated getaway from their everyday life and for those who travel environmentally conscious. 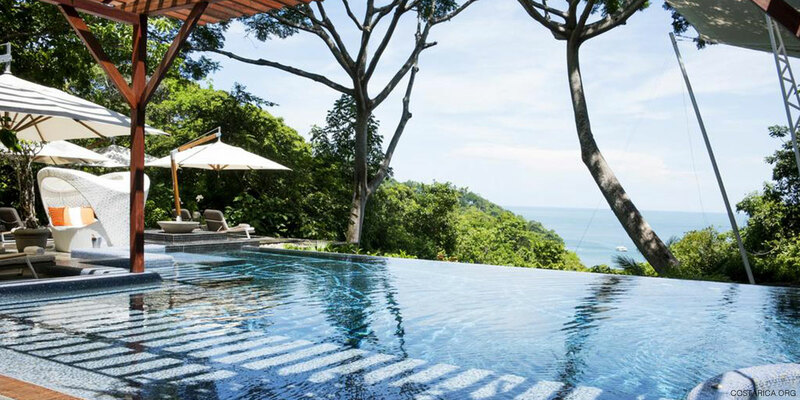 Nestled in a lush rainforest overlooking the beautiful Manuel Antonio coastline, the property itself is spectacular. One of the best parts of Tulemar Resort? You don’t have to leave the grounds of the resort to feel completely satisfied and taken care of. The 5 Star Resort features 4 swimming pools, 4 gourmet restaurants, a beach bar, an outstanding spa service and much more. If you do decide to leave the grounds (and you totally should), you will find yourself within a tropical paradise. Go and explore the Manuel Antonio National Park to see exotic animals such as monkeys, sloths, hummingbirds as well as visiting one of the most beautiful beaches in all of Costa Rica. If you are looking for luxury accommodations in a tropical location, Tulemar Resort is the place to go. If you are willing to travel in style and comfort while you visit Costa Rica, the Westin Golf Resort & Spa might be the perfect fit for you! Located in Costa Rica’s North Pacific Riviera, the 5 Star Westin Resort offers you and your family ultimate comfort and luxury. Besides the golf greens, gourmet restaurants and the lagoon-style swimming pool, you can also find several off-site activities just around the corner. The best feature about the Westin Resort? It is situated right next to the beach! After a long and adventurous day, you can take advantage of the Heavenly Spa by Westin and rejuvenate with a full body massage or relax in a Jacuzzi. Enjoy yourself at the white sand Playa Conchal and try various watersports, you are guaranteed to have the vacation of a lifetime! Florblanca Resort truly has to be seen, words can hardly do it justice. Lying right on the oceans edge, guests looking for long strolls on the beach and rustic romance will find their paradise at Florblanca Resort. But not only the nature around the resort is stunning, Florblanca is in a league of its own as a small 5 Star boutique hotel with all the luxury and services of a huge resort. Enjoy a gourmet meal at the indoor/outdoor restaurant or pamper yourself with a selection of body treatments, facials, wraps and scrubs. Outside of the resort you will find the authentic little surf town Santa Teresa, which is ideal for enjoying many types of activities, such as surfing, yoga, horseback riding, snorkeling and many more. Florblanca Resort is one of the best places in Costa Rica to disconnect and relax from the outside world. The JW Marriott Guanacaste is the perfect 5-star luxury resort for families. The resort fits beautiful white sand beaches and exciting activities all into one location. Start your trip by relaxing in the luxurious rooms and suites, each complete with beautiful views of Guanacaste. After a day of traveling, pamper yourself with a soothing bath and indulge in rejuvenating treatments at the hotel spa, or dip your toes in the sparkling pool. When the cravings arise, treat yourself at one of the gourmet restaurants. End a fulfilled day at one of the many beaches surrounding the 5-star resort before retreating to your room for a restful evening. Consider yourself lucky, when you are staying at the JW Marriott Guanacaste, you are not only situated at one of the best beaches in Costa Rica but you are also staying at one of the most exceptional resorts in the country. This intimate adults-only resort is one of the most luxurious and romantic 5-star escapes for singles, couples and honeymooners. But be aware: the views may spoil you. The property’s infinity pool faces toward the South Pacific Coast and seems to blend right in with the ocean’s horizon. No filter will be necessary at this picture-perfect boutique hotel, which promises to make your Costa Rica vacation the most memorable time of your life. If you are interested in day adventures you can head out to Corcovado National Park for untouched rainforest and wildlife or snorkeling at Cano Island. Don’t forget to check out Marina Ballena National Park and the area’s signature “Whale Tale” formation along the coast. Kura is undoubtedly the most uniquely designed 5-star resort in all of Costa Rica. Arenas del Mar is proof that staying at an eco-resort doesn’t mean roughing it: Its 38 state-of-the-art rooms are among the nicest in Manuel Antonio, the gourmet restaurant is excellent, and the spa will restore your energy after a long day. The 5-star resort features a lush rainforest, two beautiful white-sand beaches on site and diverse wildlife to allow you to truly connect with nature. One of the best things at Arenas Del Mar? The resorts operates sustainably and their everyday sustainability practices are also shared with the community through an education program. There truly is no better place to enjoy your Rainforest vacation getaway then at the 5-star resort Arenas Del Mar. If you are looking for a remote getaway from your everyday life, look no further. These private oceanfront villas on a pristine Guanacaste Beach will leave you in awe. The impressive rooms, unparalleled views, stunning infinity pool and beautiful beach turn this luxurious resort in one of the top destinations of Costa Rica. Plus, this is a hotel with a heart: Punta Islita is environmentally friendly, and gives back to the local community. The resort also offers a variety of onsite activities, including art sessions, cooking lessons, horseback riding, and zip-lining. The unique location of this extraordinary 5-star hotel delivers ambiance and comfort that is hard to beat, even in Costa Rica! As you discover and explore, play and relax, there will be more surprises, and your dream vacation will come true. All in all, Hotel Punta Islita is where you are going to have the best time of your life! Costa Rica is a place of immense natural beauty and adventure. There are two breathtakingly beautiful coasts, spectacular forests and mountains, endless activities and an incredible selection of upscale hotels and resort, making it difficult to choose the right accommodation for your dream vacation. So, whether you are looking for a relaxing and intimate beachfront boutique hotel, an all-inclusive beach resort or a one-of-a-kind jungle lodge, our picks of the best 5-star hotels in Costa Rica will help you make your decision.